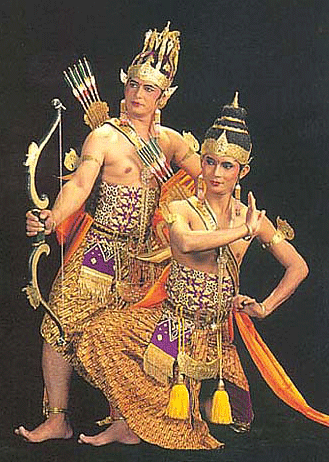 Gorontalo is one city I've ever been there so many cultures that I see starting from marriage until tombilotohe. I was there the father Fadel Muhammad still serves as the father of the governor in the province of Gorontalo. including a highly developed provinces quickly. here I'll tell tombilotohe. 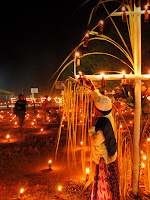 Tumbilotohe which consists Gorontalo language in the sense of the word "tumbilo" means the tide and the word "tohe" means a lamp, which shows pairs of night lights or lamps. This tradition is a sign would be the end of the holy month of Ramadan, has inspired a victory for the citizens of Gorontalo. Implementation Tumbilotohe before sunset until morning for 3 last night welcomed the victory on the day before the Eid. Amid the feel of victory, the sky is dark because the moon does not show its rays. Residents then believing that such a moment is an opportune time to reflect on ourselves as human existence. This is a most beautiful moment to realize ourselves as nature created by Allah SWT. According to history Tumbilotohe activity has been going on since the XV century, as illumination is obtained from the resin, tree sap that can burn for a long time. Resin and then wrapped with a leaf and placed on the timber. Along with the development times and reduced resin, lighting made ​​with coconut oil (padamala) which is then replaced with kerosene. After using the resin, coconut oil, then kerosene, Tumbilotohe experiencing a shift. Almost all residents replace lighting with flickering lights in various colors. However, some people still maintain traditional values​​, namely wearing light bottles on display in front of the house on a framework of wood or bamboo. At nightfall, "ritual" Tumbilotohe begins. The city looks bright. There was hardly any dark corner. Dim lit night lights bottle in front of people's homes look charming. 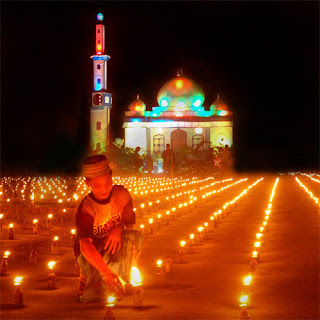 Gorontalo city turned lively as the lights not only illuminate the bottle yard, but also illuminate the page office, the mosque. No exception, field plots of vacant land to the soccer field filled with light bottle. Society as united in religious feeling and the same solidarity. On vacant lands, distant area, the lights bottle shaped picture mosque, the holy book the Qur'an, to calligraphy. TUMBILOTOHE become a magnet for the immigrant population, especially citizens of the neighboring town of Manado, Palu, and Makassar. Many people who visit just to see Tumbilotohe Gorontalo. 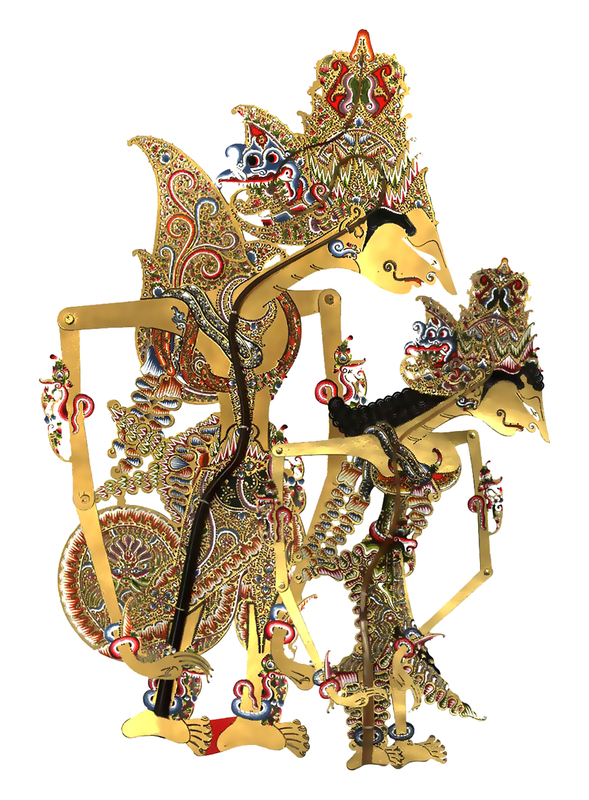 Throughout the trip at Gorontalo area then we will see Tumbilotohe from a wide variety of forms. "It is wonderful when we walk in the night" was the expression on most people who spoil the eye all the way to enjoy the lights of every home, office and mosque. 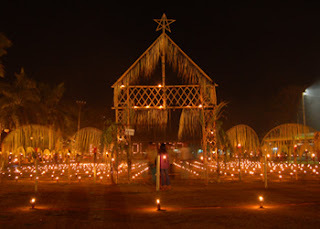 Alikusu consists of yellow bamboo, decorated with coconut, banana trees, sugar cane and oil lamps are placed at the entrance to homes, offices, mosques and a local border gates. At the gate there is a dome of a mosque that became the main symbol alikusu. Residents decorate with leaves that are dominated Alikusu yellow leaf. Above the skeleton was hung some bananas and sugar cane as a symbol of prosperity symbol of sweetness, kindness, and honor to welcome Idul Fitri. Bunggo made ​​of bamboo choices for each link it, except the tip segment, punched. Near the very end of the segment given a small hole filled kerosene. Small hole as a place to set fire to give off chug. But this tombilotohe reap many protests from the young scholars in Gorontalo is considered as a bid `ah in the teachings of Islam. but for me this is the culture that we must guard. goooooo GORONTALOOO.